Question Are adults with higher genetic risk for schizophrenia more likely to live in urbanized and populated areas than those with lower risk? 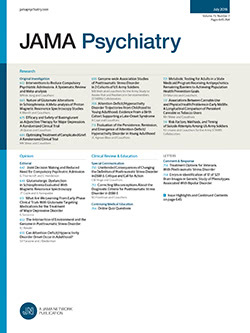 Findings In this cross-sectional study of 4 community-based samples from Australia, the United Kingdom, and the Netherlands (N = 504 130), significantly higher genetic loading for schizophrenia was identified in participants living in more densely populated areas; mendelian randomization on a subsample suggests that schizophrenia may have a causal association with the tendency to live in urban areas. Meaning The higher rates of schizophrenia in cities may be accentuated by selective migration to cities of participants with higher genetic risks. Importance Urban life has been proposed as an environmental risk factor accounting for the increased prevalence of schizophrenia in urban areas. An alternative hypothesis is that individuals with increased genetic risk tend to live in urban/dense areas. Objective To assess whether adults with higher genetic risk for schizophrenia have an increased probability to live in more populated areas than those with lower risk. Design, Setting, and Participants Four large, cross-sectional samples of genotyped individuals of European ancestry older than 18 years with known addresses in Australia, the United Kingdom, and the Netherlands were included in the analysis. Data were based on the postcode of residence at the time of last contact with the participants. Community-based samples who took part in studies conducted by the Queensland Institute for Medical Research Berghofer Medical Research Institute (QIMR), UK Biobank (UKB), Netherlands Twin Register (NTR), or QSkin Sun and Health Study (QSKIN) were included. Genome-wide association analysis and mendelian randomization (MR) were included. The study was conducted between 2016 and 2018. Exposures Polygenic risk scores for schizophrenia derived from genetic data (genetic risk is independently measured from the occurrence of the disease). Socioeconomic status of the area was included as a moderator in some of the models. Main Outcomes and Measures Population density of the place of residence of the participants determined from census data. Remoteness and socioeconomic status of the area were also tested. Results The QIMR participants (15 544; 10 197 [65.6%] women; mean [SD] age, 54.4 [13.2] years) living in more densely populated areas (people per square kilometer) had a higher genetic loading for schizophrenia (r2 = 0.12%; P = 5.69 × 10−5), a result that was replicated across all 3 other cohorts (UKB: 345 246; 187 469 [54.3%] women; age, 65.7 [8.0] years; NTR: 11 212; 6727 [60.0%] women; age, 48.6 [17.5] years; and QSKIN: 15 726; 8602 [54.7%] women; age, 57.0 [7.9] years). This genetic association could account for 1.7% (95% CI, 0.8%-3.2%) of the schizophrenia risk. Estimates from MR analyses performed in the UKB sample were significant (b = 0.049; P = 3.7 × 10−7 using GSMR), suggesting that the genetic liability to schizophrenia may have a causal association with the tendency to live in urbanized locations. Conclusions and Relevance The results of this study appear to support the hypothesis that individuals with increased genetic risk tend to live in urban/dense areas and suggest the need to refine the social stress model for schizophrenia by including genetics as well as possible gene-environment interactions.